Including fruit nutrition information, facts,calories, list and chart. Fruits and vegetables have been recognized as a good source of vitamins and minerals for nearly a century now. Adding fruits and vegetables to your diet is probably one of the most important steps toward eating healthy. According to the new food pyramid, it is recommended that we have about 4.5 cups or at least 400g of fruit in a day. A cup can be equal to one small apple, one large banana or one large orange. You can have your fruit in all forms; fresh, dried, frozen, canned and 100% juice. Whole fruits, however, usually contain more fiber than juice. People who eat more generous amounts of fruits and vegetables as part of a healthy diet are likely to have reduced risk of chronic diseases, including strokes, type 2 diabetes, some types of cancer, and perhaps heart disease and high blood pressure. Eating enough fruits and vegetables helps you to get adequate nutrients and fiber which can help you lower your risk for many diseases. Fruits, along with vegetables have been said by one person or the other to be good for us. They are a vital part a balanced diet, and the rest of this article serves to inform you why. Fruits add color, variety and taste to our meals and are packed with vitamins, fiber and minerals. Vitamin A for instance, maintains eye health and boosts the body's immunity to infectious diseases. Potassium promotes proper nerve and muscle functioning, and B Vitamins are necessary for converting food into energy. Vitamin C can increase the body's absorption of calcium and iron from other foods. Calcium is an essential mineral for strong bones and teeth and low iron levels can lead to anemia. Fruit nutrition and vegetable nutrition facts are important for one to know in order to fully appreciate the benefits we can get from them. A lot of people nowadays want to know how to eat healthy. They want to but do not have the know how. The time that we are living in calls for just that more than ever. There is just too much of the processed and fast foods, and people are generally leading busy lives. However, eating healthy is not as hard as you think. All you need is some motivation, determination and you are ready to hit the healthy eating highway. When it comes to calories, did you know that fruits displace foods that are high in calories and low in nutrients. They are naturally low in calories and may be an important way to prevent and treat obesity. A study has concluded that diets that are high in fiber are associated with lower body weight.Water and fiber in foods increase volume and thereby reduce energy density. In their natural state, fruits have high water and fiber content and are low in calories and energy densities. 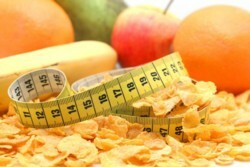 Dietary fiber, regardless of the source, has also been linked to weight regulation. They are a good source of vitamins, minerals and dietary fiber and therefore play an important role in preventing specific nutrient deficiencies, such as Vitamin A and Vitamin C, and promoting healthy bowel function. Fruits contain micro-nutrients such as Vitamin C and Vitamin E, which serve as powerful antioxidants that can protect cells from cancer-causing agents. Antioxidants are also linked with keeping our hearts healthy. Studies have reported that high fruit and vegetable intake can reduce the risk of a stroke by up to 25%. Fruits such as oranges are a good source of folate. Folate helps prevent birth defects such as spina bifida. The higher intake of fruits seemed to increase the ventilation function of lungs in children who are asthmatic. Diets that are high in fiber may be able to help in the management of diabetes. This happens because soluble fiber delays glucose absorption from the small intestine and thus may help prevent the spike in blood glucose levels that follow a meal or a snack. 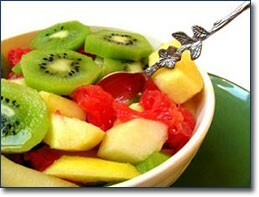 Since fruits are high in fiber, they aid in gastrointestinal health. They can calm an irritable bowel and, by triggering regular bowel movements, can relieve or prevent constipation. Fruit nutrition together with vegetable nutrtition facts show that eating plenty of fruits and vegetables also keeps our eyes healthy. They can help prevent two common aging-related eye diseases- cataract and macular degeneration. In general, a diet rich in fruits, vegetables and whole grains appears to reduce the chances of developing these diseases. Variety of different fruits and vegetables is therefore key. Fruits and vegetables are also classified into five color groups, according to the phytochemicals they contain. There are many phytochemicals that work together to protect health. So in order to receive a great variety of phytochemicals in your diet, there is need to choose fruits from each of the color groups everyday. Orange or yellow fruits are colored by natural plant pigments called 'carotenoids'.It's been reported that carotenoid-rich foods can help reduce risk of cancer, heart disease and can improve immune system function. Citrus fruits like oranges are an excellent source of vitamin C, and folate. Some examples of fruits in this group include: pineapple, mangoes, peaches, nectarine apricots, pears, oranges and yellow apples just to name a few. Blue or purple fruits are colored by natural plant pigments called anthocyanins. They act as powerful antioxidants that protect the cells from damage. Other studies have shown that eating more blueberries is linked with improved memory function and healthy aging. Some examples of this group include: raisins, purple grapes, blueberries, plums, prunes and blackberries. Red fruits are colored by natural plant pigments called lycopene or anthocyanins like the blue or purple fruits. Lycopene in watermelon for instance, may help reduce the risk of several types of cancer, especially prostate cancer. A few examples of the red fruits include: watermelons, strawberries, red apples, red grapes, cherries, raspberries and cranberries. , are very good sources of potassium. A few examples include: dates, brown pears, bananas, white peaches and nectarines. Green fruits are colored by the natural plant pigment chlorophyll. They, like the orange or yellow foods are particularly rich in antioxidants. Some examples of the green fruits include kiwi, green apples, avocado, green grapes and honeydew melon. When you think of fruit nutrition, it's important that you remember that fruits require proper handling, preparation and storage in order to take full advantage of their many nutrients. Read more on this in the article eating healthy on a budget. So now that you have all this information on fruit nutrition, why don't you go ahead and grab one now, and embark on a colorful, healthy eating journey!! 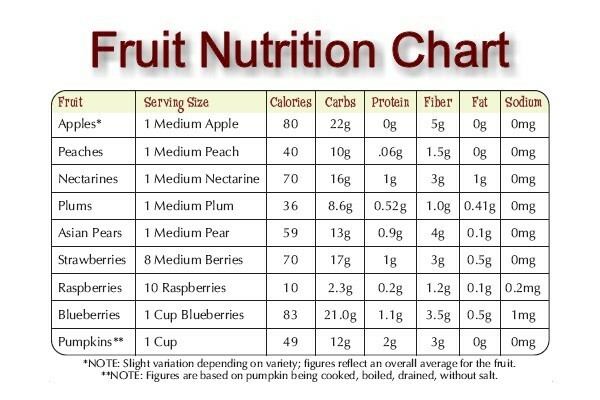 Here is an example of a fruit nutrition chart with just a few fruits. Showing the minerals and vitamins you can gain from them. It also displays the calories in each fruit. Bananas are one of the very good sources of potassium, which amongst other things helps to maintain a normal blood pressure level. This is one fruit that is loaded with minerals, vitamins and nutrients that are essential to our bodies. This article includes Small, Medium, Green and Dried Banana Nutrition Facts and Potassium. Small they might be but strawberries are a power pack when it comes to the nutrients it contains. They are an excellent source of Vitamin C. In fact, a serving of about 8 strawberries is said to contain more Vitamin C than an orange! This article covers straberry nutrition facts Fresh, Frozen, Activia, Chocolate covered and more. Oranges as most of us know are a great source of Vitamin C. Vitamin C is an antioxidant which amongst other things helps to strengthen and boost our immune system. This article includes Mandarin, Navel, Blood, Valencia and Clementine Oranges Nutrition Facts, Skin and Analysis. If you are looking for a fruit that is rich in Dietary Fiber, Folate and Iron, then you should turn to avocados. They are an excellent source of these, especially dietary fiber. This article includes avocado nutrition facts, hass, whole, florida, sushi roll, health benefits and more. 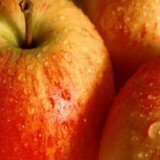 Apples are mostly a good source of Vitamin C and Dietary Fiber. They are low in calories and are included in many weight loss diet, whether in their whole form or milled to produce apple cider vinegar. This article covers apple nutrition facts, gala, granny smith, green, red delicious, fuji, pie, juice, butter, apple cider vinegar and fritter. Guavas are a seasonal fruit which are rich in Vitamin C. When compared to oranges, they contain more Vitamin C than their citrus counterparts, which is something one wouldn't expect. This article includes guava nutrition facts, juice, paste, pastry, pineapple guava and health benefits. If you are looking for a fruit that is rich in antioxidants, Vitamins A and C then apricot are what you should have. They are packed with all the goodness, minerals, vitamins and nutrients that help our bodies. This article covers apricot nutrition facts, dried, kernel, jam juice, nectar and health benefits. If you are looking for a fruit that is an excellent source of Manganese and Vitamin C, then the Pineapple's what you are looking for. Find out what benefits there are in eating pineapples. This article includes pineapple nutrition facts, fresh, frozen, dried, canned, crushed, dole and health benefits. Watermelons are sweet, crunchy and full of water, making them a perfect summer fruit. Fruit nutrition facts on watermelons reveal that they are the only fruit with the highest amount of lycopene. This article explains what lycopene is, watermelon nutrition facts, raw, sour patch, seeds, juice, seedless and health benefits. Mangoes like most fruits are delicious, nutritious and low in calories. Find out about their nutritional value and what health benefits they have to our bodies. This article covers mango nutrition facts, raw, dried, frozen, juice, chutney, salsa, health benefits and more.